From the end of February to mid-April, the performance of the many cherry blossoms is on full display. It's great fun to celebrate the full-blooming Somei Yoshino blossoms, but experience the hotel's "Hanami Style"
for a uniquely refined way to admire the flowers of spring. To know the beauty of newly blooming sakura, the earliest sakura are just right. The flower arrangements in the hotel lobby and Le Jardin, as well as the Seikoen bonsai in the Plaza lobby are must-sees. In the early morning, the cherry blossoms gliestening in the sun are a sight of beauty that only staying guests can know. Why not stay at the hotel, and have the morning sakura all to yourself? Enjoy a private Japanese-style room room as you relax and admire the cherry blossoms. 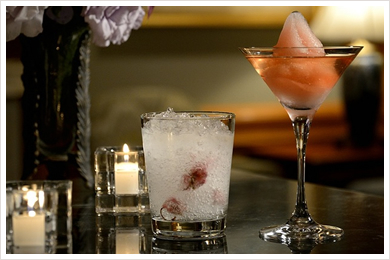 With a cup of Japanese sake in-hand, lively conversation is sure to ensue. Produced by lighting designer Reiko Chikada, the light display of "Garden Symphony of Spring" will illuminate the cherry blossoms with the colors of spring. 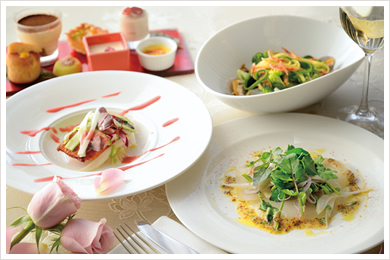 Like the colors of the newly-blooming flowers, delicious food has a seasonal appeal overfloeing with fresh flavor. 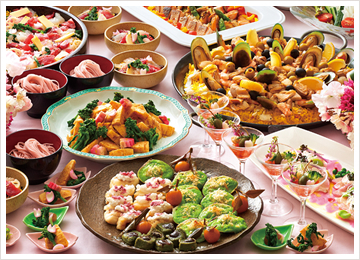 Taste refined banquet dinners that a bright with the colors of sakura, and rich with foods of spring. Tasty, hot food will warm you in this still cold season. Seafood-rich paella seasoned with fine saffron, tuna and whitefish, bamboo shoots, and broccolini on bara-chirashi, as well as sakura soba kneaded with sakura jelly. 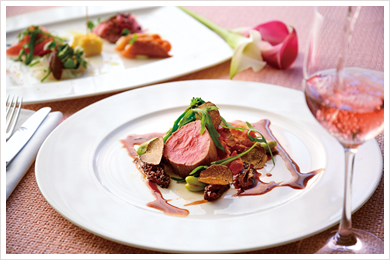 Our widely varied menus feature foods that capture the season, and the color and aroma of cherry blossoms. 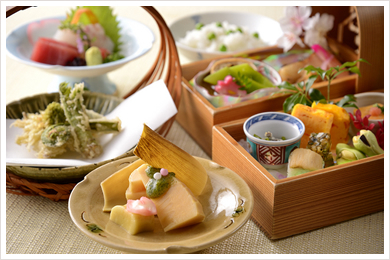 Like the sakura loved by all, the gentle flavor and colorful decorations are sure to delight. 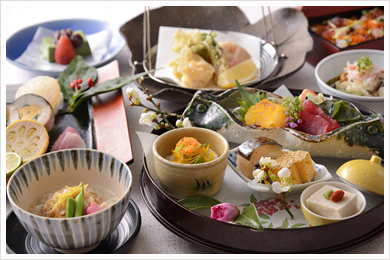 *For adults, dates between 3/21 and 4/12 are 600 yen extra. 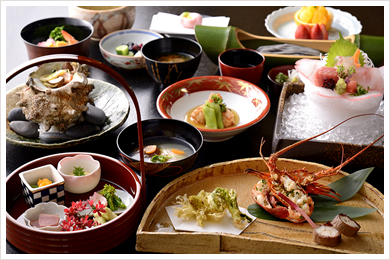 This special dinner includes the popular roast beef as well as sushi. 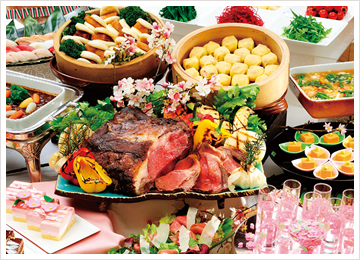 It includes fresh spring vegetables, and tasty snacks to accompany drinks. 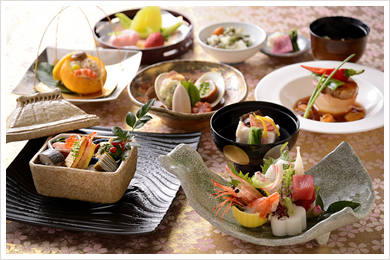 Gaze at the night sakura and dine on fresh cuisine as you lounge elegantly during this sleek banquet. Day or night, guests can enjoy the beauty of the sakura-filled garden with our stay plans or luxury spa treatments. 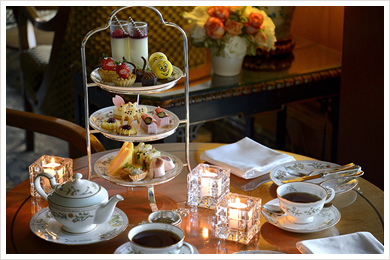 We introduce plans to change your spring day into a fine luxury experience. 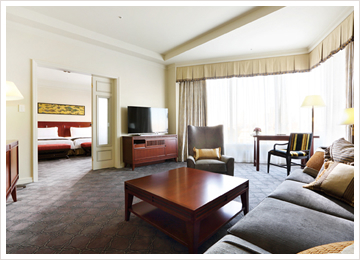 Our newly redesigned Prime Floor rooms present unprecedented elegance and functionality. It features decor inspired by Japanese design elements such as Ukiyo-e and Arita ceramics, as well as the useful additions of a couch sofa and Hansgrohe shower head. A 90-minute treatment to usher in the new season. 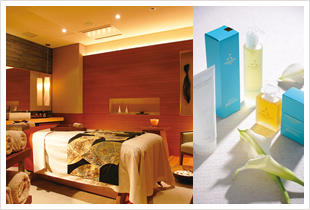 After skin treatment with a body brush, an oil massage will revive your body and spirit alike. The fragrant oil of Aromatherapy Associates' REVIVE series brings the joy of awakening to your skin. 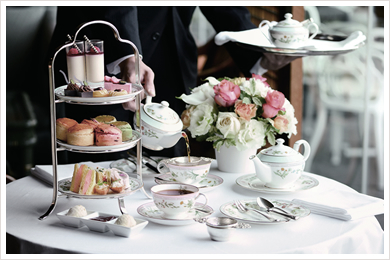 After treatment, relax with a cup of cherry blossom-flavored tea. For an additional 3,100 yen, a pair room can be used for treatment of two guests. 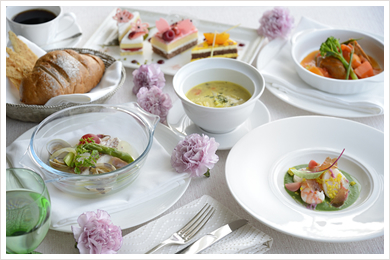 The delightment of the cherry blossom season makes an ideal gift for someone special. 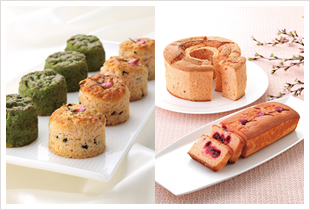 Sakura-scented chiffon fondue, or our prized sakura and green tea scones are guaranteed to please. We also recommend our adorable and tiny Hina dolls. 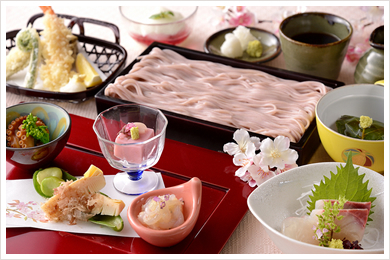 Taste cuisine filled with the flavor of the sakura season. 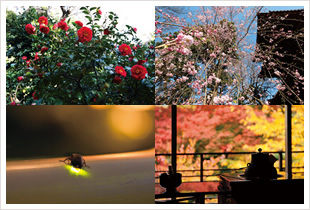 The red camellias lighting up winter, the spring blanketed in cherry blossoms, the dancing fireflies of summer, and the red leaves of autumn... the changing seasons of the garden are the treasures of Hotel Chinzanso Tokyo. We've prepared a special present campaign to enjoy the wonder of each season. Lucky winners will be awarded with presents. 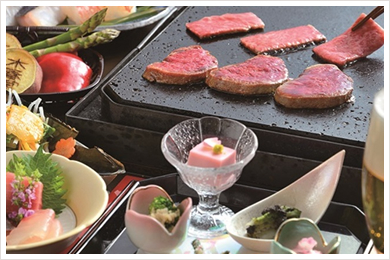 Spending 5,000 yen (tax and service charge included) or more on a stay, restaurant, or supported event will earn one stamp. Collect two stamps or more to apply. Guests will receive a stamp card upon their first purchase. After receiving stamps, submit the card at locations within the hotel, or by mail.